This is a POOP TO YOU Toast to the lady in the restaurant last night who was asking me to take my pooping daughter off the toilet so that she could use the bathroom. After all, this pushy lady told me, my daughter was in the bathroom for a very long time. As Blondie said, “When you have to go, you have to go.” Hope someone pulls that grouchy woman off the toilet mid-poop someday! Just because you sing while you poop doesn’t mean you are sitting on the toilet for fun and not function. Mombshell Kisses To Robert Sinskey! On our retreat we visited Robert Sinskey Vineyards. Not only were we treated to wine tasting bliss–it was organic wine tasting bliss. EcoMoms out there take note: if you want to taste some orgasmic organic wines, this is the place to come. All three Mombshells were ooooohhhhing and ahhhhing over the delight our tastebuds found in each sip. 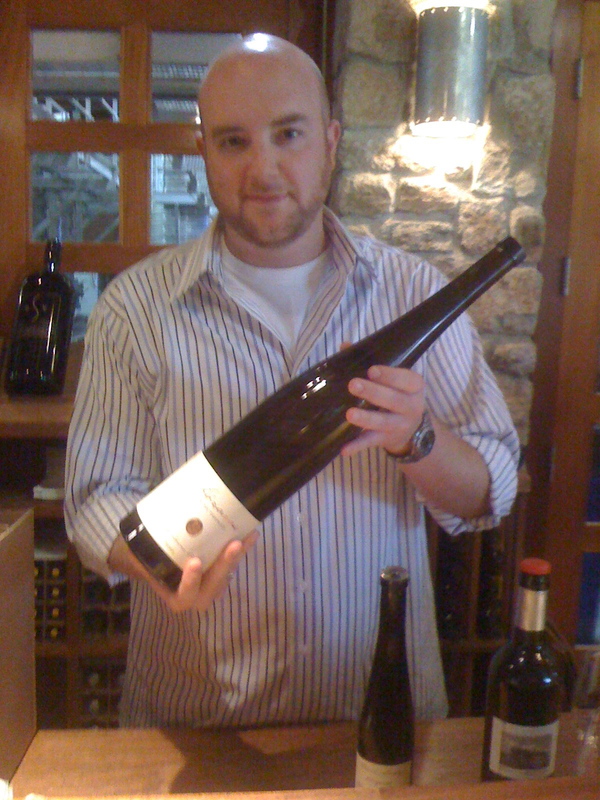 A delicious, gorgeous magnum of Pinot Blanc 2007! Info from their site: Robert Sinskey Vineyards is an organic farm. This means that all grapes used in making RSV wines have been certified Organic by the California Certified Organic Farmers. Robert Sinskey Vineyards is now one of the largest and most progressive organic vineyard operations in Napa Valley. Smack! Thanks for the tastings, the free P.NO hats and loading all of those cases into Bangshell’s car, which by the way, doesn’t smell like old, stinky $200 lunch milk. By golly, if they didn’t give her a new phone! Thank you, Verizon, for making a little girl’s day. My lovely massage music was the tune of doors slamming, people laughing, yelling, banging, and all kinds of conversation. At the end of the massage I told my therapist that she did a great job, but there was no relaxation at all with the party going on next door. Then she admitted to me that we were also adjacent to the break room. The director on the way out apologized and said that he had had this complaint many times before. DUH! He handed me a pass to use the “spa facilities” on my next visit to the city. Are you kidding me??? If it’s broke, brother, why the hell don’t you fix it? A Mombshell Toast going out today to the woman in front of me at Gymboree. You cut in front of me in line, then you proceeded to pay with a check. After writing the check, showing your photo I.D. and reciting your driver’s license number, you decided you didn’t want the red shirt. The saleswoman cheerfully voided your check and re-adjusted your total. You then decided to pay in cash, but then you realized the yellow shirt marked $4.99 wasn’t actually $1.99, like you thought. You then called for a manager to discuss that when the $4.99 tag was placed on the shirt, it covered the $11.99 tag making it look like it was $1.99. When I left you were still speaking with the manager about how the store should give you the shirt for $1.99 because it was so misleading. Meanwhile, I would have had time to run back to the car to get my cloth tote bags, if I had just thought of it! Meowwwwwwww! Here’s to the lady going out of business in the Antique Capital of the World. Maybe if you were a little NICER to your customers you would still be IN business. Goodness! I grew up with a family restaurant and the first thing my dad taught me is that the customer is always right. NOW, dad also taught me that the customer is always right and could be a psycho, so handle with care. AND, no matter how wrong the customer really is, pretend s/he is right and solve the situation without giving too much free stuff away. I learned from my own experience, that sometimes, the best way to solve the situation is to act stupid, but know that you are ten times smarter than the customer anyway, so acting stupid is really about being smart. However, this isn’t a situation where the customer wanted anything but niceness and consistency. On a recent first visit to this particular antique shop, I showed interest in a painting. I asked the owner about the best price on this $125.00 painting. She went on and on about how it was already marked down and to clear the price the consigner wanted she would wave her fee and let it go for $85.00. I thought this was a bargain price, but still had to think about where to hang it in my house. I called later that week and asked if she still had the painting. She did. I asked her the price again and she said $125.00. I mentioned that she had quoted me a better price. She replied, if I wrote a check, she could let it go for $95.00. I said I thought it was $85, and she said she had it marked at $145 and bristled at my audacity to ask for a lower price. Now maybe I was mistaken, but I’m pretty good with numbers and prices and percentages. Being reasonable, in my head, I figured, fine, the extra 10 was a scam, but I liked the piece and it really was not all that much money. Everyone knows you can’t even frame anything for that price. I go back to the shop and she pulls the picture out and starts ringing it up at $105.00 plus tax. I remind her of our conversation, and she huffs over to a drawer, hands me a card with a name on it and simply says, “Make the check out to this person,” and walks away to the other side of the store. She doesn’t offer me a bag, wrap the painting in paper, thank me or bid me good day. I eyed the door and thought about walking away from the purchase, but heck, I did want the painting. This is just to say, no wonder there is a ‘closing’ sign on her shop today. You cultivate your own karma. This is to my husband who keep me level and sane. We had an overnight in the city and he made what could of been a disaster into a wonderful trip filled with all the things you hope for on a weekend away with your significant other. Wine, chocolates and an evening under the stars. Thank you! Thank you! Thank you! P.S. Funny how enough red wine and excellent company can make a double bed that’s as hard as a rock heavenly. Read into that what you will. Just noticed my fabulous Burke-Williams Spa complimentary passes are for Monday-Thursday. Not that I would go back there, but GIVE ME A BREAK!